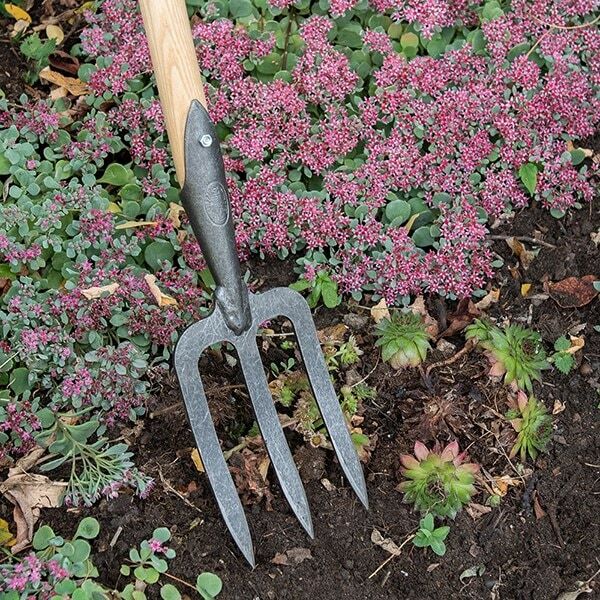 Buy De Wit small fork with long 'T' handle: <ul><strong><li>Dig and separate bulbs while standing</li><li>Forged carbon steel with a solid ash handle</li><li>Lifetime guarantee</li></strong></ul><br>Work in closely planted flower beds, veg rows and borders without having to kneel or sit with this De Wit long-handled fork.<br><br>The compact, lightweight head is hand-forged from tough carbon steel with three bevelled tines for superior soil penetration.<br><br> It is bolted to a long ash T-handle for comfortable no-bend digging. As the handle will naturally shrink over time, a locking nut fixes the head in place - letting you simply re-tighten it to keep the fork solid and strong.<br><br>Easy to carry and use, the fork is a great lightweight alternative to a traditional garden fork for working in smaller areas.<br><br>Measurements:<br>Head 11cm x 17cm<br>Total length 110cm<br><br><strong>About De Wit tools</strong><br><br>The Dutch are renowned for making the world’s finest garden tools, and De Wit is the most respected name of all. Founded in 1898, the family-owned toolmaker combines old-fashioned quality and craftsmanship with innovative design to create superior tools that last a lifetime.<br><br>Every tool is hand-forged in the Netherlands from tough boron steel - shaped, sharpened and burnished for durability, giving it the same blackened patina as traditional Edwardian tools. Each is fitted with an FSC-certified solid ash handle for ultimate strength and shock resistance, oiled to provide first-class protection against the elements.<br><br>All De Wit tools come with a lifetime guarantee against manufacturing defects, making them a truly once in a lifetime purchase. 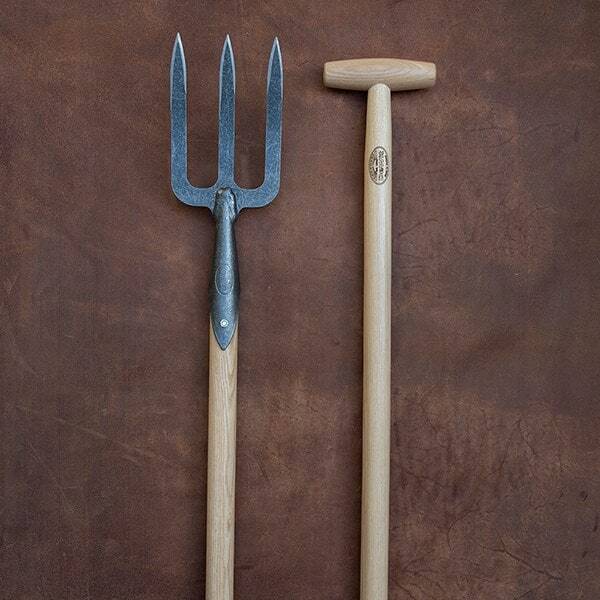 Work in closely planted flower beds, veg rows and borders without having to kneel or sit with this De Wit long-handled fork. The compact, lightweight head is hand-forged from tough carbon steel with three bevelled tines for superior soil penetration. It is bolted to a long ash T-handle for comfortable no-bend digging. As the handle will naturally shrink over time, a locking nut fixes the head in place - letting you simply re-tighten it to keep the fork solid and strong. 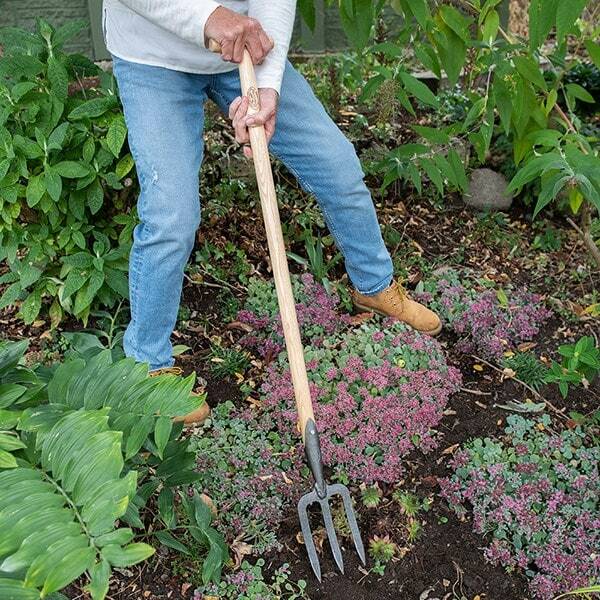 Easy to carry and use, the fork is a great lightweight alternative to a traditional garden fork for working in smaller areas. I bought the De Witt hand fork with long T handle and use it constantly. It has very sharp prongs and is very useful for weeding and working the soil between tightly packed plants in my cottage type garden. It's lightweight and replaces a border fork which is too bulky. Great two pronged fork. Good for weeding and lifting. Comes in useful for all sorts of uses. It's in my garden trig and goes around the garden with me and really does come in handy . Nice handle and a great quality item. So glad I got it.